The TV show is just the beginning. Here’s what you need to know if you want to spark some joy in your own home with Marie Kondo’s life-changing KonMari magic of tidying up. 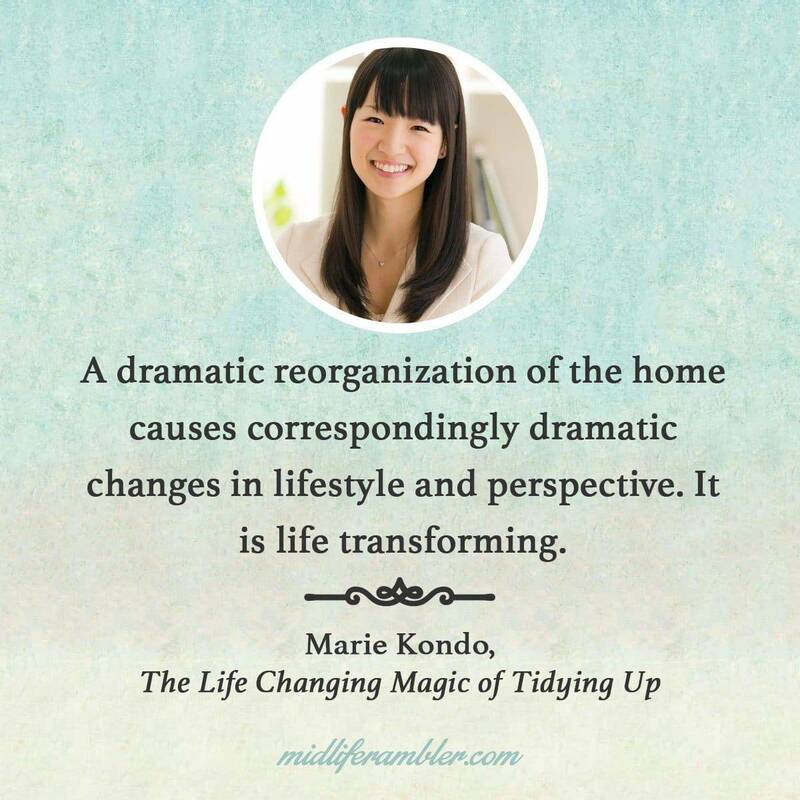 In 2015, I read Marie Kondo’s The Life-Changing Magic of Tidying Up and it really and truly changed my life. Before embracing the KonMari Method, I had been a wanna be neat person in a slob/hoarder’s body. I loved looking at pictures of clean, spare uncluttered rooms but I had no idea how to bring that sort of serenity to my life. After I read the book, I embarked on a massive tidying up spree around the house and took my blog readers along with me. This post may contain affiliate links. For more information, see my disclosures here. So you can imagine how thrilled I was in early January when suddenly my Facebook and Instagram feed was filled with pictures of piles of discards and organized drawers. Everybody was talking about “sparking joy.” Thanks to the Netflix series, Tidying Up with Marie Kondo, the whole world seems to be on a KonMari kick. 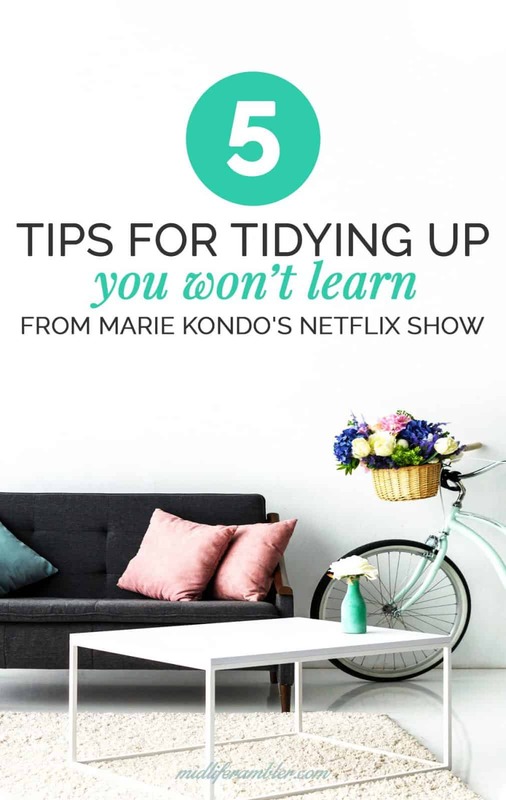 But as great as the series is for inspiration to start your own tidying project, a one-hour episode can only give you an overview of the KonMari process. After following the KonMari process for the last few years, I’ve got a few tips to share if you’re planning your own KonMari Tidy-Up session. 1. Give Yourself Time. You’re not just changing your house, you’re changing your mindset about your possessions. When you follow the KonMari method, you’re really working on changing yourself and the way you regard the objects in your home. Instead of blindly following the typical American habit of acquiring more stuff and then buying containers to hold your stuff, you’re evaluating the things you own to determine if they are really supporting you in becoming the person you want to be. As you’re determining what you keep and what you discard, you’re also determining just what kind of person you want to be. It’s very difficult to go from a space like this…. … to this without the help of Marie Kondo herself. Be gentle with yourself. This might sound like I’m directly contradicting Marie’s advice, but I’m not! In her book, she says that in order to change your mindset and affect lasting change, you must embark on a tidying up marathon rather than falling into the trap of tidying up a little bit each day. 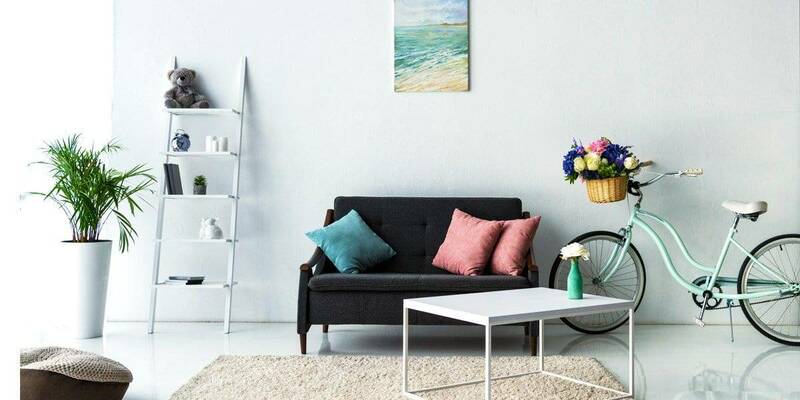 Seeing the dramatic results of your tidying session will inspire you to change your mindset forever and you’ll never fall victim to clutter again. 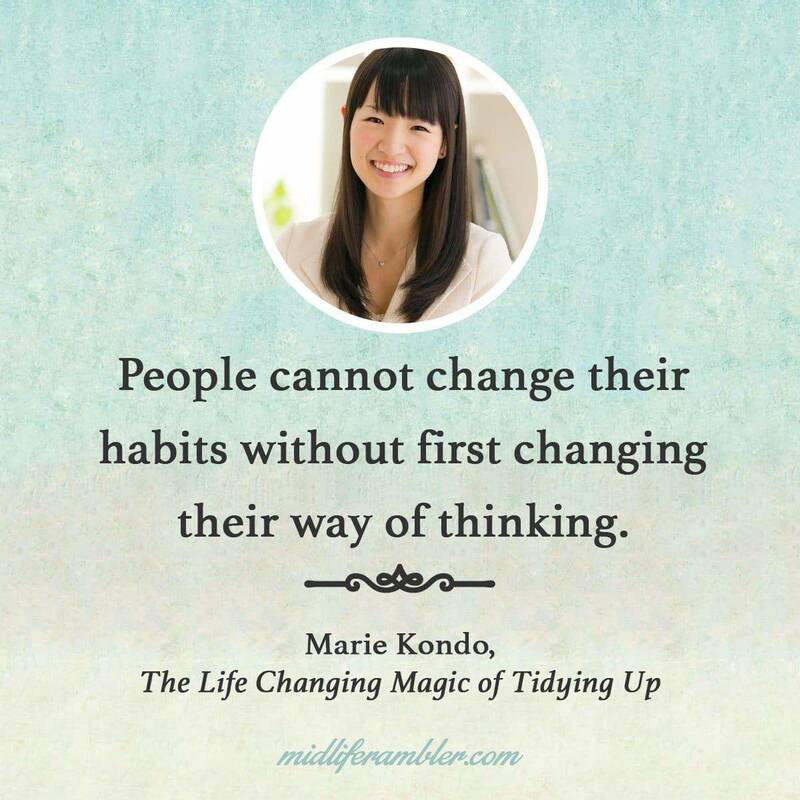 She’s right that seeing the results of a tidying marathon will motivate you to continue the process, but I’ve found that I’ve actually needed to go through the KonMari process multiple times so that I can continue to evolve my mindset. When I first organized my clothes way back in 2015, I kept four pairs of nearly identical black flats because I liked them all; they all “sparked joy” for me. However, as the years have gone by, I realized that I tended to wear only one pair of these shoes regularly and the other pairs would get hidden in the back of my closet. I finally determined that the joy of looking at a tidy closet was much bigger than the joy I got from those shoes and I gave away the three pairs I rarely wore. I’ve gone through the whole KonMari process once a year for the last 4 years and each time I end up happily discarding items I kept the previous year. I also think most people would find would find their energy flagging if they went through the whole process all in one go. I like to start with my clothes and get those organized and then move on to my books after some time has passed so I can start that job with renewed energy. As the years have passed, my tidying projects take less and less time so it doesn’t drain as much energy as it did when I started my first round in 2015. I went through all my clothes over one afternoon last week and I’m planning to take a couple of hours this weekend and revisit my books. 2. What to do if you can’t decide what “Sparks Joy” for you. The Netflix series does a great job of showing the struggles people can have when they’re evaluating what possessions truly give them joy. I’m sure we’ve all agonized over a punch bowl that we’ve never used, that takes up valuable cabinet space, and keeps us from easily finding the objects we do use. But it’s so pretty! And what if we have a party and want to serve punch? If you’re really stuck on determining what sparks joy and what doesn’t, here are a few tips for determining whether to keep or discard an item. Imagine yourself using the item. Are you imagining a realistic situation or are you in a fantasy? For years, I kept a black velvet cocktail dress that I had worn once and no longer fit. And yet I agonized over getting rid of it. What if someday I lost weight and then was invited to a fancy occasion in the winter (you can’t wear velvet in summer, you know)? What would I wear? I actually laughed out loud when I thought of it that way. If such a day were to occur in my life, then I’ll just buy a better dress! I thanked the dress and gave it away. I know it sounds a little weird, but it really is helpful to think of your item as something that wishes to be loved and to be of service. That punch bowl we just talked about – does it really want to live in your cabinet waiting patiently to be used or would it prefer to live in the home of someone who will use it frequently? I like to imagine someone coming up on the item in a Goodwill and being thrilled to find it and take it home. That usually makes it easier to let it go. If you really can’t decide, keep it. Tidying isn’t about forcing yourself to become a person with zero possessions, it’s about moving to the best mix of possessions that’s right for you. You can always come back for another round later and see how you feel then. If you feel so overwhelmed looking at your giant pile of clothes (or whatever) that you just don’t know what to do, try to quickly pick three or four items that you absolutely love. Remember that you’re not focusing on what items to get rid of, you’re focusing on which items you want to keep. 3. 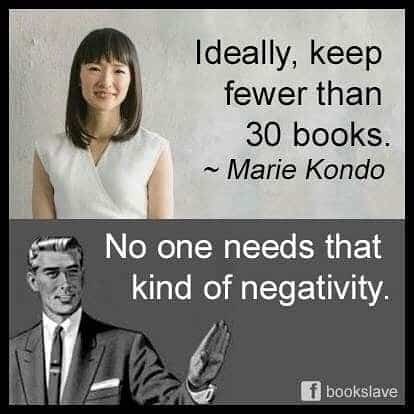 You can have more than 30 books. Have you seen this meme going around? Fortunately, it’s a bit deceptive. Although Marie Kondo does say she likes to keep her own personal book collection down to about 30 volumes, you don’t have to follow suit. The essence of the KonMari philosophy, after all, is to keep the items that bring you joy. So, if a book, or any other item you like to collect, brings you joy, then keep it! I might read it someday. This doesn’t mean I got rid of every book I hadn’t read, but just the books that I kept because I feel like someday I should read it. For me, that was a lot of classic literature that I knew I wasn’t ever going to really enjoy reading. Books of photographs. It’s very rare that I’ll go back and relook at these even if I thoroughly enjoyed looking at the book the first. By culling my book collection down to just those volumes that really give me a thrill to look at, I’ve made my living space much more joyful. Here’s Marie herself to let you know you can have as many books as you want. 4. You haven’t failed at KonMari if your house gets messy. Everybody gets busy and lets things slide occasionally. You may look around one day and see that clutter has crept back onto your kitchen counters or that the laundry is still sitting on the living room sofa waiting to be put away. This doesn’t mean you’ve failed at keeping your home organized. 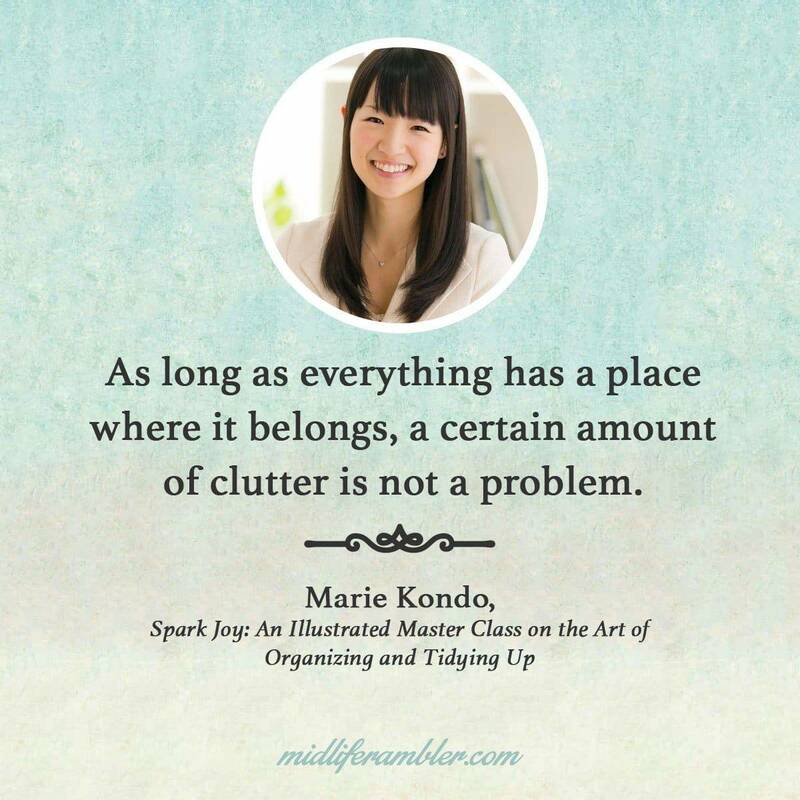 Marie talks about the issue of clutter in Spark Joy: An Illustrated Master Class on The Art of Organizing and Tidying Up. The point of organizing your home is to make sure that every item you keep has a designated place to live. If you’ve organized your house successfully, you can deal with clutter that accumulates by simply putting everything back in its assigned place and you can typically do this quite quickly. When clutter accumulates, simply take a bit of time and return the items to where they belong. 5. You can use the KonMari Method to actually change your life. Really! Once I started asking myself if the objects in my house sparked joy for me, I found myself asking the same question about other aspects of my life. Does it really “spark joy” for me to “relax and recharge” by spending an entire evening on my couch drinking wine and watching television? Sometimes, yes, but I noticed that I often feel lazy and unmotivated afterwards – the opposite of relaxing and recharging. That doesn’t spark joy for me! Now, I try to use my time in ways that truly spark joy instead of mindlessly sitting on the couch all evening. I’ve applied the same thought process to the food I eat. I used to focus exclusively on calories and what I “should be eating” in order to be healthy. Now, I try to listen to my body and eat what it seems to be craving. Sometimes, my body craves nachos and when it does, I joyfully indulge. But I find that more frequently, my body is craving wholesome, healthy food with delicious flavors.I used to cook chicken breasts with as little added fat as possible (just a light dab of cooking spray and always, always skinless and I was rewarding with a bland, unenjoyable meal every time. A few nights ago, I baked chicken breasts for dinner using this recipe which used a variety of spices, chicken stock and (gasp!) a half stick of butter. It was so delicious that I actually groaned with pleasure when I tasted it. Dinner time that evening was a delicious sensory experience instead of a spartan, depressing, tasteless meal designed only to quell hunger. I left the table satisfied and, yes, full of joy. I’m just a little bit obsessed with Marie Kondo! 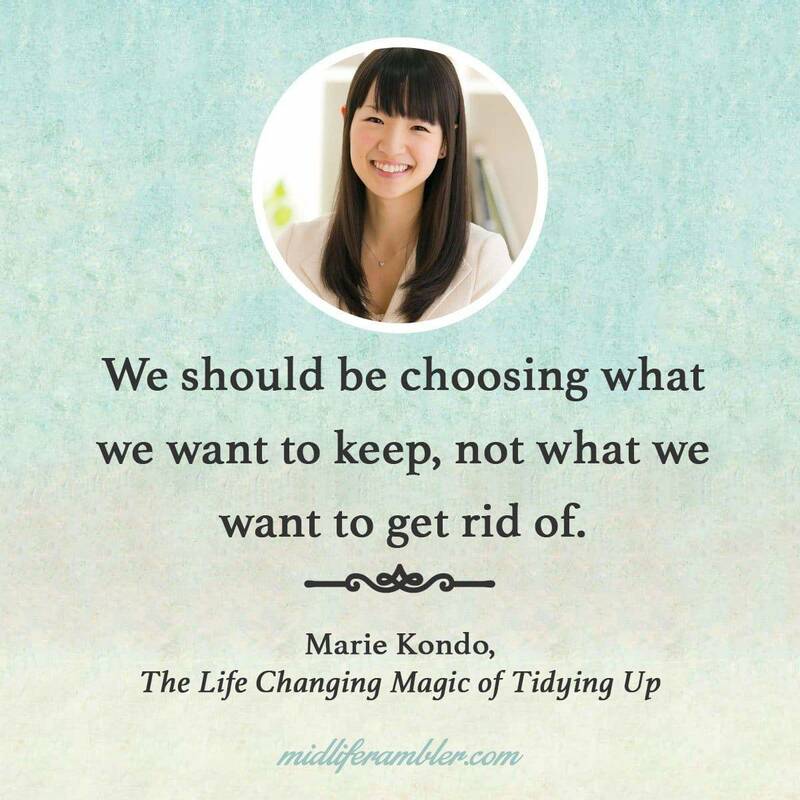 If you would like to find out more about the KonMari method, check out these posts! Save to your favorite Organizing Board on Pinterest Right Now! Hi! I'm Katy and I started Midlife Rambler when my youngest child was a senior in high school. I was staring at the coming empty nest and wondering what was next for me. Does that sound like you? Then you'll love our community of fun, feisty women. We're looking forward to the next phase of our lives and talking about all the exciting (and sometimes a little scary!) times ahead.